If you are interested in buying an airbrush, you might need to consider also other airbrush equipment in order get you started right away. 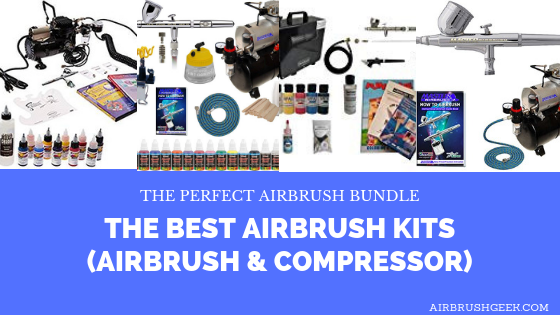 The most important one being the airbrush compressor.Obviously you could buy the airbrush and the airbrush compressor separately, but if you buy them together in an airbrush set, you will most certainly get them at a better price than if you buy them separately. Those following airbrush kits includes airbrushes and compressors but also an assortment of extra that will help you getting started. In this article,I will review the best airbrush kits around, and will tell you what I think would be a good choice buying, so enjoy and happy airbrushing! - 0.92 gallon (3.5 liters)Tank. - Automatic On/Off Shutoff, Air. Iwata Deluxe Airbrush Set is probably the best airbrush kit in terms of overall quality build. This airbrush kit comes with the one of my favorite airbrush, the Iwata Eclipse HP-CS . This Airbrsuh kit is the top choice when considering an Iwata Airbrush Kit. The Eclipse is great because this airbrush’s high flow allows it to atomize a wider variety of liquids with less need for reducing or thinning. The Eclipse HP-CS offers a broad spray range, as compared to other airbrushes, where it is possible to achieve a controlled fine line to controlled wide spray. The Iwata HP-CS airbrush has a generous 0.24 oz / 7 ml fluid cup with lid that is ideal for color mixing. This Iwata airbrush kit comes with the Iwata IS 850 Smart Jet compressor – the most popular choice for low to medium pressure applications. Iwata Smart Jet features auto-shut-off technology. The preset air flow produces a working pressure of 20-25 PSI and the bleed valve may be used to lower the pressure. Built-in airbrush holder and Iwata airbrush hose included. This kit comes with 10 each 1oz bottles of Com Art Colours – half transparent and half opaque, 8oz bottle of Medea Airbrush Cleaner, a Pistol Grip Moisture Filter, an Artool Freehand Airbrush Template (FH-2 SP), and 2 How-to DVDs: Airbrush from Scratch and an Artool Template Instruction video. The Iwata Deluxe kit is one of the most complete Kits from Iwata and makes an amazing gift for the airbrush enthusiast in your life. Comes with the Compact and Quiet Iwata Smart Jet IS 850 Compressor. Overall great quality build Iwata airbrush kit. The Paaasche Airbrush kit is a great kit. It comes with the Paasche TG-SET “Talon” Gravity Feed, internal mix airbrush , a real high end airbrush with a .38mm needle which delivers the highest level of detail and control. The Paasche Talon has a rather large .4 ounce cup size. This airbrush set comes also with the Master TC20-T airbrush compressor, a compressor with a 0.92 gallon (3.5 liters) tank that will help smoothing out the pulsations from the single piston compressor and also help deliver a constant air pressure. The Master TC20-T has an air regulator with gauge and air filter. It is a light-weight, quiet and compact compressor, easy to carry thanks to the carrying handle. This is another great airbrush kit with an all purpose airbrush at a very good price as well. I would have liked to get the .66mm tip included with this airbrush bundle, it would have been the perfect beginner kit but you can still buy it separately if you feel like it. The Talon is a quality airbrush with smooth trigger action. Master TC20-T compressor with tank. This Iwata HP-CS\Master TC-20T airbrush set is great airbrush bundle. The Iwata Eclipse HP-CS is a dual-action gravity feed Airbrush with a 0.35mm needle/nozzle and a 1/3 ounce. funnel shaped gravity fluid cup along with a 6′ Braided Hose. It comes also with the Master TC20-T airbrush compressor, a compressor with a 0.92 gallon (3.5 liters) tank that will help smoothing out the pulsations from the single piston compressor and also help deliver a constant air pressure. The Master TC20-T has an air regulator with gauge and air filter. It is a light-weight, quiet and compact compressor, easy to carry thanks to the carrying handle. There is also a LOT of extra airbrush equipment in this airbrush set, which is great especially if you are a beginner. They will make your life that bit easier. – 3-in-1 Use Airbrush Cleaning Pot along with Airbrush Cleaning Solution. As you can see, this airbrush kit as really everything you need to start airbrushing right away, I love it. Paint included is good for learning but you are probably going to have to buy some better one eventually. The Badger airbrush multiple airbrush starter system features everything the new and aspiring airbrush artist requires to successfully start airbrushing. This Badger airbrush kit comes two airbrushes: The Badger Patriot 105 airbrush, a dual action, internal mix gravity feed Airbrush with a .50 millimeter needle/nozzle for spraying all types of mediums, inks, dyes, watercolors, acrylics, enamels, lacquers, glazes, latex, Air-Opaque, Air-Tex, MODELflex, Totally Tattoo, and Totally Tan colors. The Badger Patriot 105 (check my Badger Patriot review), American Made, really is an high quality build airbrush at a very competitive price. Very easy to clean and disassemble , it is the ideal airbrush for beginners but it will also suit more advanced users. Very versatile tool, the Badger Patriot 105 will suit most project works, those that require large surface coverage but also be suited for projects with more fine details. It comes also with the Badger 350 , which is a quality build single action airbrush. It feels comfortable, light weight and is really easy to control.The Badger 350 is also very easy to clean, which is always a plus. The compressor is the Badger TC910 aspire Pro, a 1/6 horsepower, on-off switch compressor with a maxium pressure of 57 psi (4 bar). It has a one gallon (3 liter) built-in tank, built-in moisture filter and 2 airbrush holders.The Aspire Pro has a sturdy metal outer case with handle,which make it easy to carry. It has an adjustable air regulator, and pressure gauge and a built-in moisture filter. Really a great airbrush compressor. Additionally, this system includes a complete maintenance pack and a needle lubricant for easy airbrush cleaning and maintenance. The Master Airbrush Kit is probably the most affordable airbrush kit you can get. This airbrush bundle comes with the Master G22 airbrush, a Chinese made airbrush made bu TCP Global. The Master G22 is versatile gravity feed airbrush with a 1/3 oz. cup size, with a a 0.3mm tip. You can buy the 0.2 and 0.5mm nozzles and needles are also available to buy. With this, you will also get the Master TC-20T high performance single-piston airbrush air compressor with air storage tank and a air filter / pressure regulator with a dial to make it easy to adjust the air pressure. Also you will get a 6 foot braided Airbrush air hose. The tank is essential with an airbrush, it eliminates any pulsing and cools the air so the moisture separator will work better. Now the G22 airbrush on its own would probably cost you less than 30$, and obviously at that price, you can’t really expect the same quality built than an Iwata Eclipse HP-CS or a Patriot 105 for instance. But nevertheless, this airbrush kit would be perfect if you are in a budget and want to start airbrushing. For a beginner I would advice to get the.5 needle, nozzle, cap kit for the Master G22 Airbrush, that would be a bit easier to use, a bit be more forgiving for thinning than the 0.3 mm the kit is equipped with by default. Versatile system is ideal for multiple uses: hobbies, crafts, fine art, nail art, temporary tattoos, cake decorating, auto-motorcycle graphics & more! Master G22 Airbrush a bit tricky to clean.